Because—yes, it’s funny—this is all true. Other people loving you is important and real and matters deeply. But the fact is that you can’t always rely on other people, but you can always, always love yourself. It’s nice when someone buys you flowers, but you know, you can buy them too. They’re right there, in a bucket of water at the corner flower shop, waiting for you! Like the feeling of someone taking you out to dinner? Take yourself out. Feel warm when someone calls you sweetheart, whispers god you’re beautiful, tucks your hand behind your ear and laughs at your jokes? You can do all that, too, and more. You don’t need anyone else there to do something important for, or good to, or kind to yourself. Another thing you can do? You can make yourself a fancy cake. 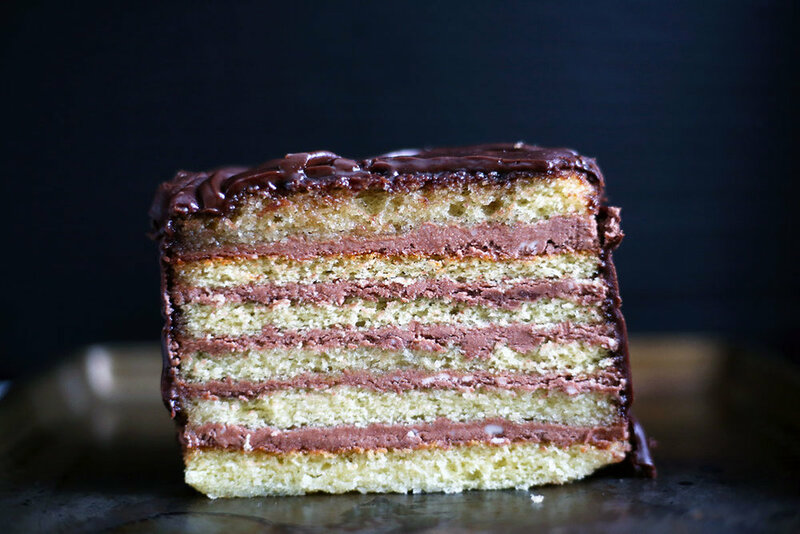 And you should—this one is modeled after a classic European seven layer cake, except I made 6 layers because the math works out easier that way with dividing the batter. Now I’ve left out one option. We’ve talked about you doing nice things for yourself. And someone doing nice things for you. But there’s one more thing, and you can and should practice it with this recipe…do something nice for someone else. Bake them this cake. And you get the soothing feeling of making something with your own hands (a lovely project for a rainy or snowy winter Sunday). To make the cake: Preheat the oven to 350 degrees F.
Cream together the butter and sugar until pale and fluffy. Beat in the eggs, one at a time, making sure each one is fully incorporated before adding the next. Add flour, salt, and vanilla and mix just until the batter is smooth. Grease your pans: You can either use six disposable aluminum 8” x 4” loaf pans, and divide the batter evenly between all of them, or you can bake this in two 8” x 4” pans and slice the cakes afterwards. I prefer to bake it in six disposable pans because it bakes so quickly! If you’re using six pans, bake the cakes for about 7 minutes or until they just spring back lightly to the touch. If you’re using two 8” x 4” pans, you’ll need to bake them for closer to 15 minutes…start checking around then and take them out as soon as they feel set in the center and start to pull away from the sides. To make the frosting: Beat the butter in the bowl of a stand mixer fitting with the whisk attachment until pale and fluffy, at least 5 minutes. Add the sugar and beat for another 5 minutes. Scrape down the bowl and add the heavy cream, cocoa, salt, and espresso powder (if using), and beat until the frosting is smooth. If it’s too stiff, add a bit more cream. If it’s not stiff enough, add a bit more cocoa powder. To make the glaze: Whisk together the melted butter, cocoa, and hot water. Whisk in the sugar and vanilla. The glaze should be pourable but thick (adjust by adding more hot water or more cocoa powder as needed). Place the next cake layer on top, and repeat until you get to the top cake layer. You should use up all the filling in between the cake layers—I don’t put a layer of filling on top before the glaze, although you could if you want, it’ll just make the filling layers thinner. Pour the glaze over the top of the cake and use an offset spatula to spread it over the top and down the sides. Let the glaze set, then serve.